Since completing my BA in April last year, I spent the Summer busy experimenting broadly along two research lines. One line continued my interest in the edgelands, looking at outsider homes or hideaways – the dichotomy of feeling safe from the outside world versus the feeling of threat or menace of the unknown in edgelands. More on this in a later post. Another productive line of work, was a series of paintings and mixed media collages/décollages which hybridise maps, organic forms, and human-made forms. 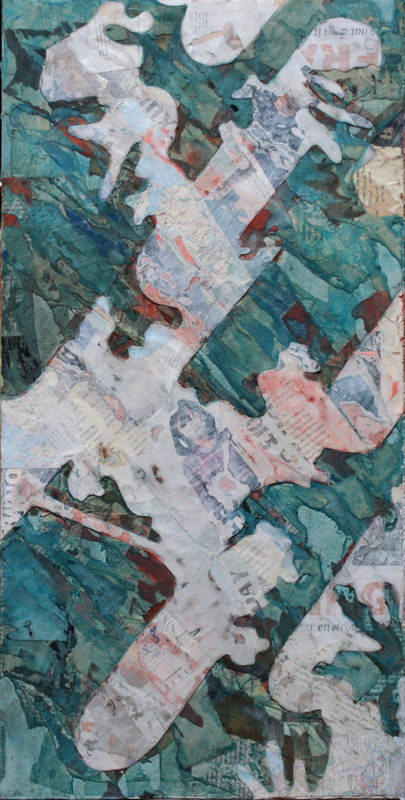 The décollage work is unashamedly influenced or inspired by the the work of Mark Bradford. Décollage being the sanding down, ripping off or cutting down into layers of collaged paper. Working with a variety of found papers from magazines, newspapers, plain coloured papers and maps, and a combination of oil paint, acrylic, varnish and turps, I developed some of the motifs I adopted in the In Parallel project. I delved further into my investigation of the relationships between organic and human-made forms. 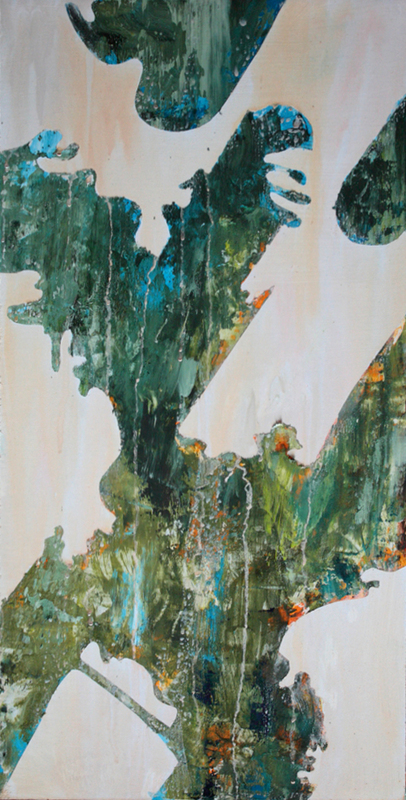 Two small designs on canvas, comprised “all over” collage, whereas for some larger studies on board I cut into the layers of paper to isolate the main shapes. In all cases, I also applied thin acrylic colour washes to help reinforce/define the designs, enhance tonal contrasts and also to bring out the textures in the décollaged paper. There are so many permutations of paint materials, layers, glues, varnishes, types of paper which all affect the final surface finish of the work, so I will continue to explore, particularly around how to bring out more contrast and vibrancy of colour in the work. Although I also recognise that one of the attractions of these pieces is the subtleties in the variations of tone and hue. Some of the works incorporate string, card or other materials (such as the cow parsley above) to create ripple effects with the overlying paper layers, although I found this has only limited effectiveness. This mode of working offers huge flexibility. I can mix in lots of different visual imagery and then the sanding down process followed by paint staining and further modifications, both degrades and homogenizes the contrasting imagery. The visual effects are subtle, complex and give a sense of time, erosion, degrading memory and nostalgia. 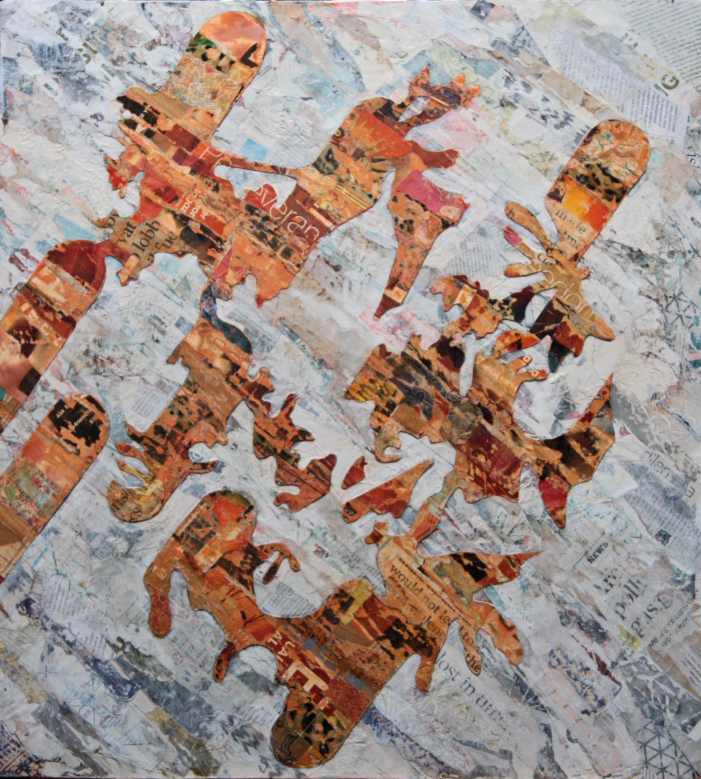 The resulting palimpsest is hard to control, and some of the images/test in the upper surfaces are lost in the sanding process but there is usually enough remaining to discern some hint of meaning, whilst almost always there are new meanings and relationships revealed upon closer inspection. A selection of these new paintings are on show in January through till the end of March 2017 at In Good Hands Café, 88/89 Frankwell, Shrewsbury, Shropshire,SY3 8JR. Its a great venue combining tasty healthy food with music events, workshops and holistic therapies.